Access to your clay, and our space and equipment, and a shelf for work-in-progress! Our open studio hours are held on Tuesday and Wednesday evenings from 6 PM – 9 PM and Tuesday and Thursday during the day from 10 AM – 2 PM. The cost is $25 per calendar month, to have access to all available dates. If you are paying online through the calendar listing or website, just choose one date during the month and pay the $25 fee. That fee is good for all open studio dates in that calendar month. This class is open exclusively to those who have completed an Introduction to Wheel Throwing or Introduction to Hand Building in the past. 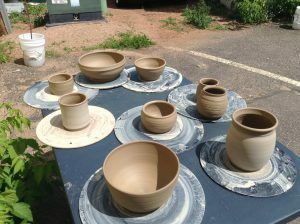 For information about upcoming Ceramics sessions, please visit the calendar. For more information, call us at 715-479-4060 or email info@eagleriverart.com.